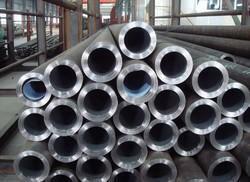 With the vast industrial knowledge, we are able to provide our esteemed customers a wide array of Alloy Steel Pipe. These Alloy Steel Pipes that we offer are made from the use of cutting edge technology. Moreover, these Alloy Steel Pipes are very simple to install and are affordable as well. Alloy Pipes are mainly used in high temperature services , for instance; these pipes are used to design boilers, super heaters and heat exchangers which are supplied in many low, medium or high alloy grades according to ASTM, BE, or DN specification. You can avail in many sizes and specifications as per your requirements.